Mie prefecture's first Forest Adventure! Enjoy the exhilaration of zip-slide together on our new double zip-slide. Group8 per.+ : ¥3,300 /1per. *1 Group rate applies to bookings of 8 or more participants. *2 Groups of 15 or more may reserve the course for their exclusive use. Prior booking is required, please contact us for details. I don't want to do the course, what can I do while I wait? There are footpaths under the course, so you can watch your family and friends in the trees. Also, there are tables and benches where you can wait, and some play equipment for small children. How do I find the park? Be careful - there are not many signs to the park, and if you put our address into a GPS/sat-nav it leads to a large area, not to the park entrance. Please check our location on the park website before you come, and if you are having trouble finding us, feel free to call the park for directions! Can I do the course all day? Is there a time limit? You can only do the course once. But there is no time limit, and you can take breaks, so feel free to take your time! However, the park will close at sunset or for bad weather. How dirty will I get? When you are up in the trees, you won't get very dirty. But every course finishes with a zip-slide, landing in wood-chip, and when you land backwards you might get dirt on your back and legs. Make sure you wear clothing you don't mind getting dirty! In Golden Week, and in August, the park is very crowded. During these periods the course will take longer to complete than usual, because of the large number of people. We highly recommend coming on a weekday during these busy seasons, if possible! 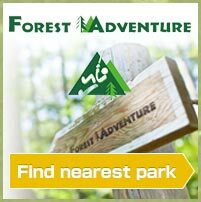 Where can I find more information about the park? 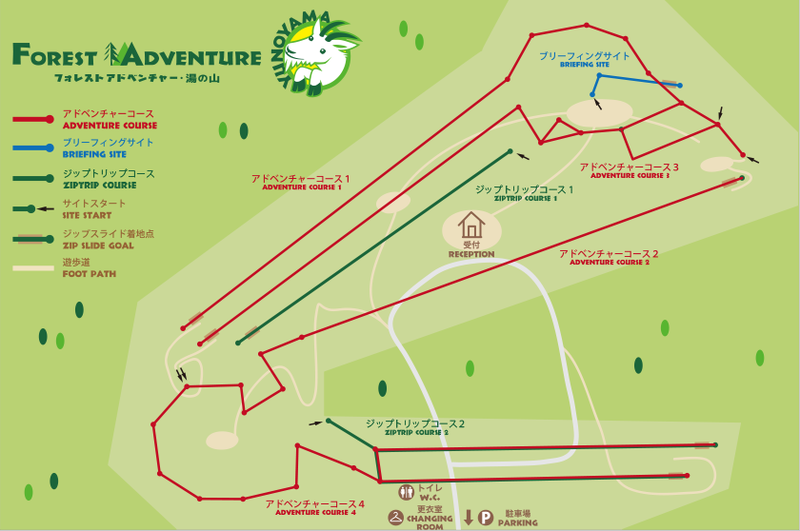 This website has the basic information, but if you want to know more detail Forest Adventure YUNOYAMA has a Facebook page and Twitter account.